The Va’a is one of several spellings used throughout the Pacific Ocean for a canoe, sometimes called va. May refer to single-or double-outrigger or to double canoes. Usually a dugout hull. Source: Aak to Zumbra a Dictionary of the World’s Watercraft. rubber strips at the same time resistant and supple ("uaua". The rower is equipped with a paddle simple, the blade of which is tilted forwards. We distinguish V1 (with a rower, " Va'a ho' e"), V3 (with three rowers, " Va'a toru"), V6 (with six rowers, " Va'a ono") and V12 (with twelve rowers, " Va'a tau' ati" or double canoe). The main differences between Va'a and Hawaiian Outrigger Canoe, hold in the absence of rudder on Va'a, whatever is the model, and in a tenser, finer esthetics. In the XIXth century, the Polynesian va'a was a daily means of transportation. Originally, the Polynesian va'a were wooden dug. Later, they were modernized by using composite materials. There are two types of tests events, those of speed in lagoon, and the marathons in open sea, with or without change of teams. The races are made on 500 meters, 1 000 meters or 1 500 meters for the speed. The marathons make of around thirty kilometers to more than 150 km. 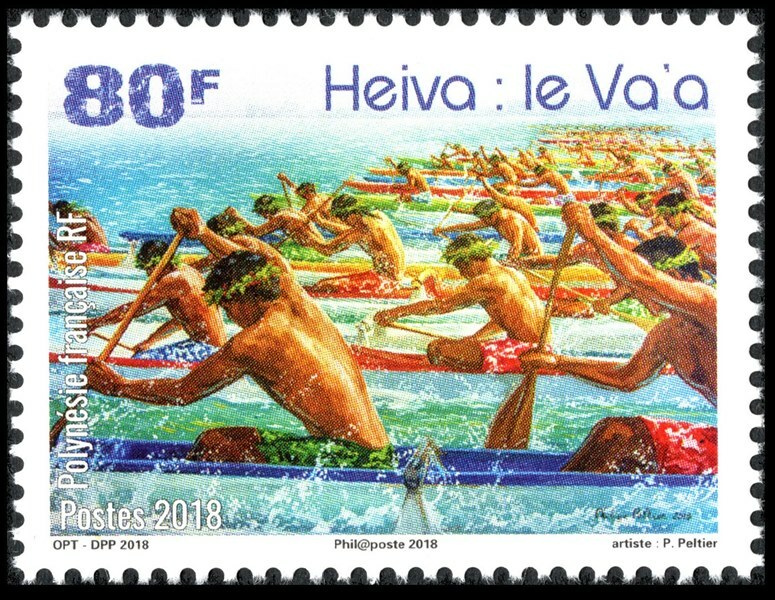 Several races of va'a organized in French Polynesia, the most mythical event is the race Hawaiki Nui Va'a which takes place every year in the Leeward Islands, in beginning of November. category "speed", besides the traditional va'a races organized within the framework of the festivities of Heiva. of this ancestral sport within the competitions of traditional sport of Heiva. French Polynesia 2018 80F sg?, scott?